First of all, the outcome of the next election, at this stage is as clear as mud and the likelihood of it getting sharply clearer is unlikely. In addition to being one of the highest stakes elections in a long time, it has the added complexity of being a pollster’s nightmare rooted in an array of unique advantages and weaknesses confronting the three main contenders for power. Despite the opaque nature of our lens on the future, the key forces which will drive the electorate are increasingly clear. 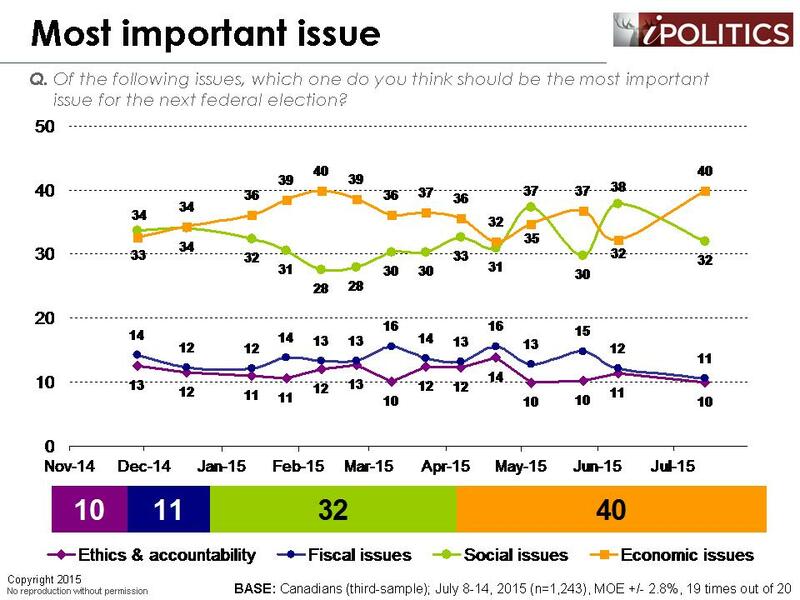 We see that at 33 points, the NDP maintains a modest, but stable lead. At 29 points, the Conservatives are hanging in, although they are still down 10 points from their 2011 election result. Nevertheless, we see evidence of a Conservatives recovery based largely on issues related to security and culture, but more on this later. The Liberals are nine points back from the lead, but are still very much in contention. The Green Party is stuck at around seven points and has fallen out of a lot of races in British Columbia. Their decline is inversely proportional to the NDP rise in B.C. (who they most directly compete with). The NDP is doing well in Quebec, but would be completely in the driver seat save for the re-entry of Gilles Duceppe (who is at 23 points in Quebec). Between the two parties, the NDP and Bloc Québécois have 60 per cent of the Quebec vote and the outcome of that race very much depends on how the Bloc fares in the future. Ontario is once again a tight three-way race, but the NDP has fallen back somewhat and there is only a six-point spread separating the three major parties. This is a real vote splitting disaster percolating for both the NDP and the Liberals. 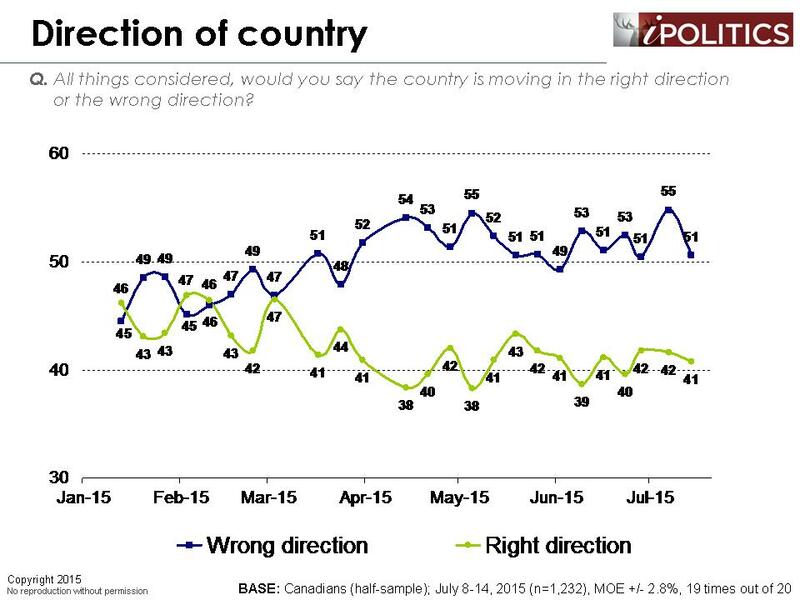 Directional measures on the country remain very poor. They are approaching historical nadirs and this doubles the challenge for the Conservatives. This is most likely due to the moribund economy (we will be updating our economic outlook indicators this week). There are two main reasons why the Conservatives are having serious difficulty getting over 30 points (which is the minimum floor to be in serious contention to win a stable government). The first is economic stagnation. However, it is important to remember that Canadians’ definition of the economy transcends mere interest rates and unemployment rates. Canadians are more focussed on the questions of how to deal with an economy that no longer produces good jobs, benefits, and security and where wealth seems increasingly concentrated in the hands of the few. Wednesday’s announcement from the Bank of Canada that the country may indeed be in a recession certainly will not bode well for the Conservative Party’s fortunes, but it is not country’s balance sheet that has Canadians down, which leads into the second force: regime fatigue. The Conservatives have been in power nearly ten years and during this time, Canadians have not felt a significant improvement in their standing of living. Instead, the economy is seen as being in recession and the vast majority of Canadians actually see themselves as stagnant or as worse off than they were when Stephen Harper achieved his stable majority. Another issue that has been gaining tracking lately is that of security and terrorism. As we entered the summer, terrorism and security seemed to be dropping off the radar altogether. However, it appears that the Conservatives have at least temporarily resuscitated these issues (thanks in no small part to their controversial ISIS ads). 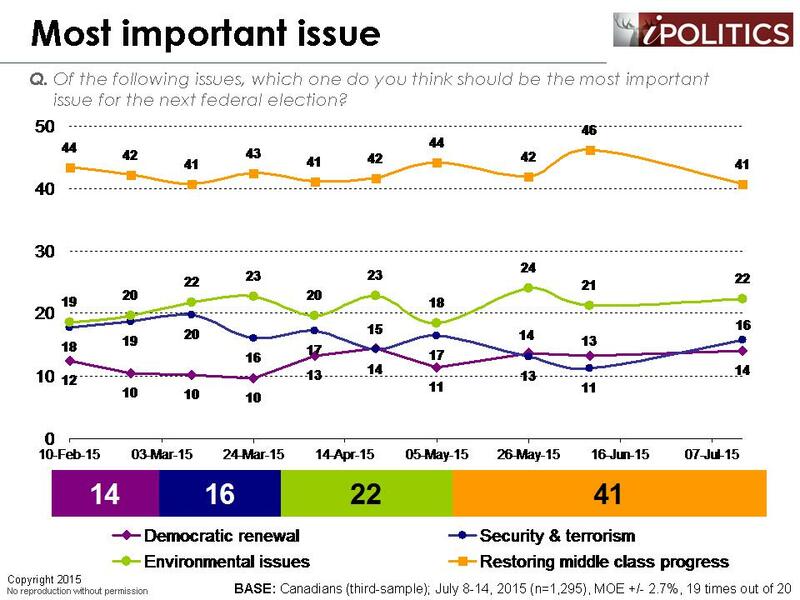 Sixteen per cent of Canadians now rate this as their most important election issue, compared to eleven per cent last month. Is the security card working? This week, we updated our tracking on attention to various issues, namely announcements and advertising from each of the three main parties. 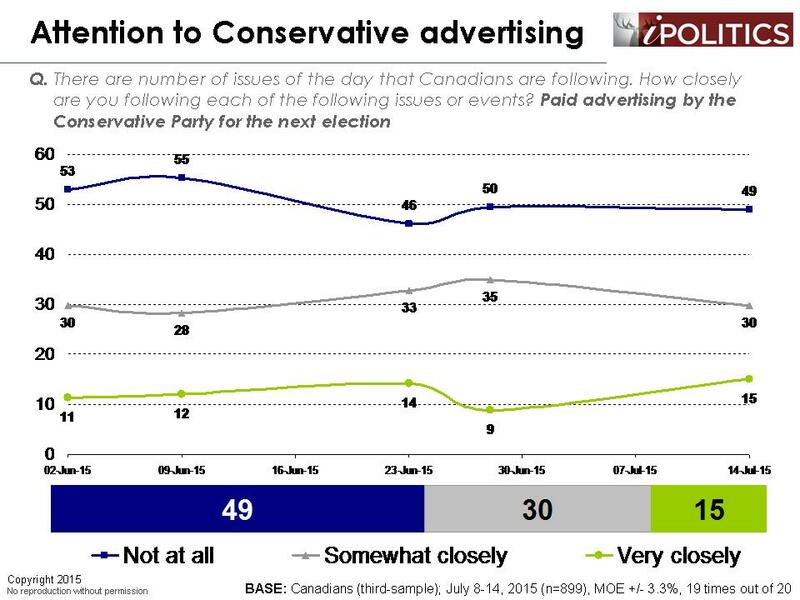 Interestingly, the proportion of Canadians who say they have been paying attention to paid advertising by the Conservative Party has jumped six points in the last two weeks, which is not surprising given the controversy surrounding the use of ISIS videos in their ads. 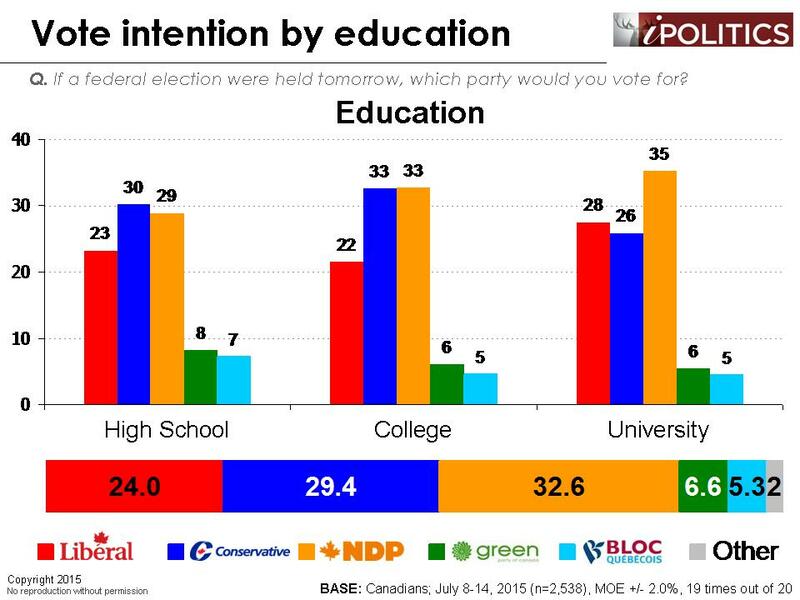 While most of the progressives and intelligentsia recoiled at the horrific and exploitative nature of the ads, the party has succeeded in connecting with their constituency of older and less educated Canadians. This adds fuel to the hypothesis that terror was a significant force elevating Conservative fortunes slightly and that it is one of the few remaining trump cards in a cupboard bare of political advantages. 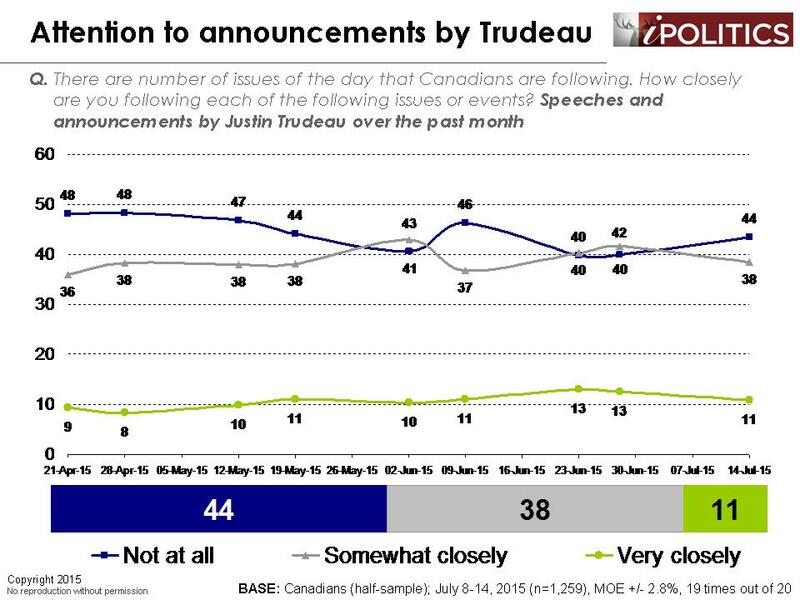 Attention to speeches and announcements by Justin Trudeau, meanwhile, has flatlined, which suggest that the party’s problems are connected to their inability to penetrate the noise floor that has kept them from connecting with Canadians and establishing themselves as the obvious progressive alternate. There was evidence that the successive high profile launches of various policy initiatives over the past six weeks moved the dials upward on “best plans”, but as attention dropped, their support dropped as well. Harper – Grr! 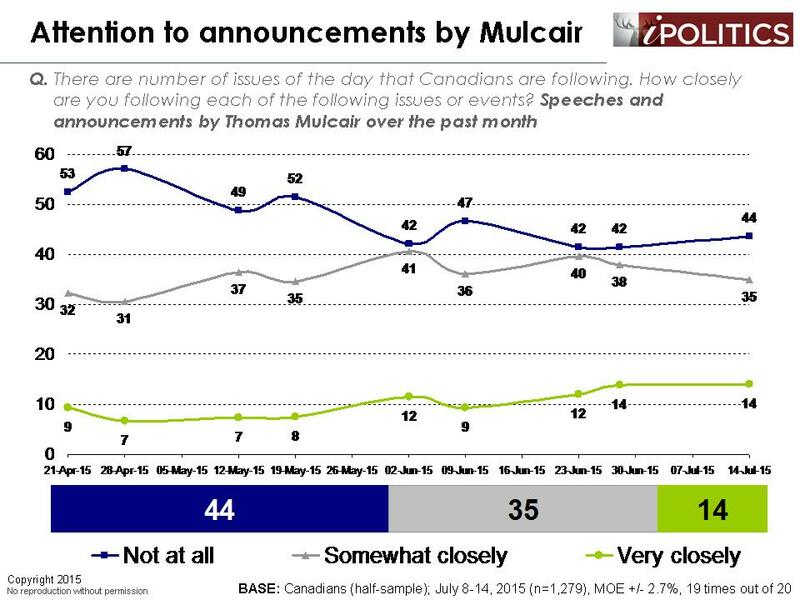 Mulcair and Trudeau – there’s a difference? 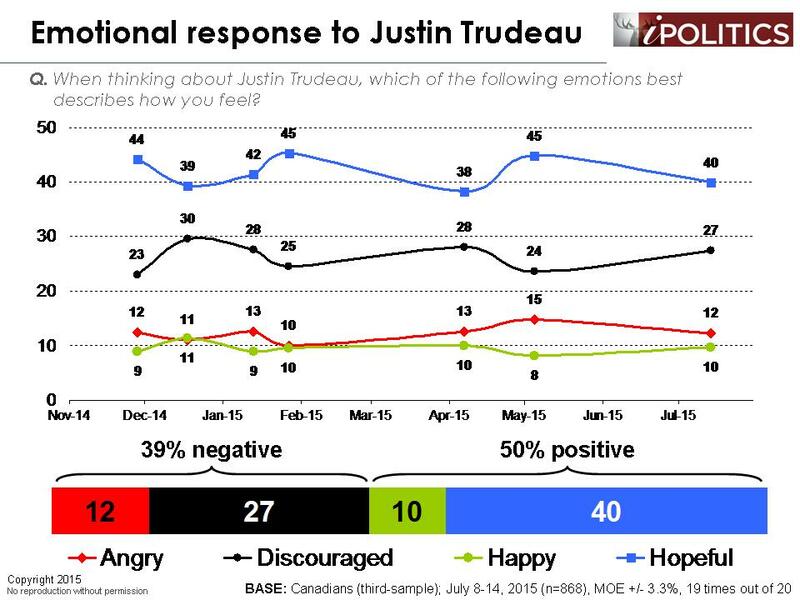 Our tracking on emotional engagement shows that the emotional response to Stephen Harper is largely very negative with a clear growth in the incidence of those who feel “angry” about him. Both Thomas Mulcair and Justin Trudeau, meanwhile, have much more positive connections. Normally, one would conclude that this is good news for the two progressive parties. However, our findings suggest that Mr. Mulcair and Mr. Trudeau are largely seen in similar terms, which raises the possibility that both leaders are largely seen as substitutable. These results underline the similarities of the constituencies the two parties are trying to attract – in effect, they are fishing from the same pool. Overall, it appears that no party is in a position to form a stable government. 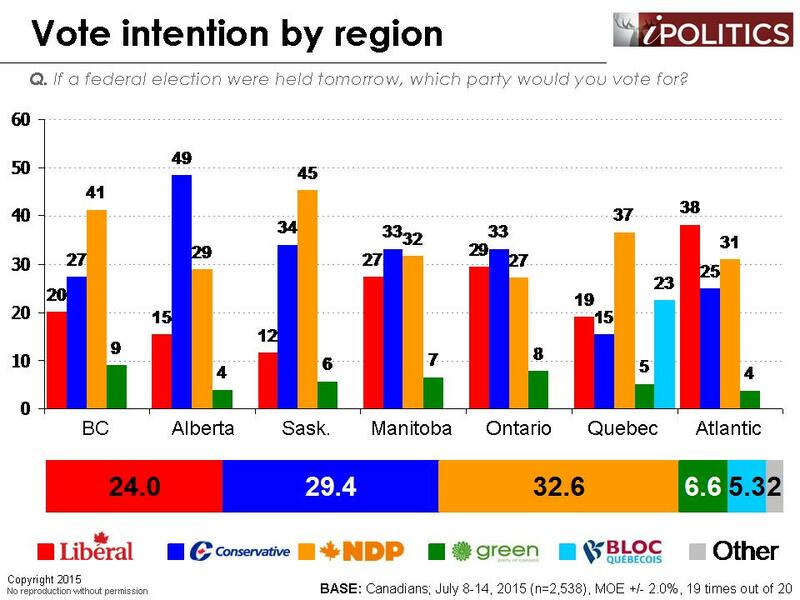 All things considered, the NDP is in the best shape and they have led for six straight weeks. Their leader scores well across the board and they have ample room for growth in terms of second choice. For those who say the NDP fortunes are just a temporary Notley honeymoon effect, we would point out that that the rise started back in February, long before the Alberta election. Rather, the NDP’s success is due more to its dominance in Quebec, its popularity with the labour movement, and its success in unifying the educated and progressive votes. Right now, the threats to the NDP are two-fold. First, the “promiscuous progressive” voters who have turned their way could return to the Liberals and this swing group has been moving back and forth for over four years. Second, the added scrutiny of being under the magnifying glass of the front runner heightens the challenge and one would speculate that the full force of the Conservative negative framing machinery will turn its focus from Mr. Trudeau to Mr. Mulcair. The Conservative Party has the most treacherous path to victory. Their meagre second choice standing leaves them with scant opportunities for growth. Directional and economic indicators are lousy and the party’s leader has by far the poorest approval ratings. Furthermore, simply “winning” is not sufficient – they will need another majority or, at the very least, a strong minority to have any shelf life, especially in light of how Canadians are warming to the idea of a progressive-led coalition government. And yet, we see the party hanging on, not that far back from where they were in the lead-up to the 2011 election. In appears their new ads have granted them a significant uptick and, in the absence of an economic case, the party is going to have to look to security and culture to resuscitate its fortunes, as this appears to be the only place were they can grow their support. The Liberals are still very much in the race and have some significant cards yet to play. They have a largely popular leader who produces a lot of hope. Their key problem is that some voters see both the leader and the party as largely substitutable with the NDP and, for whatever reasons, those voters are leaning Mulcair’s way somewhat. While it must be discouraging for the party to see how quickly the gains from their high profile platform launches can dissipate in the attention deficit disorder voting public, the key to victory lies through proving to Canadians that they – and not the NDP – are the clear alternative to Steven Harper. At this stage, there is no clear winner and the public answer to the election riddle might not be a single party, but a consortium of sorts, formal or informal, with relative indifference as to who should lead. We suspect this force may play itself out. In any case, there is a good chance that the ultimate victor(s) may remain elusive until October 19th. 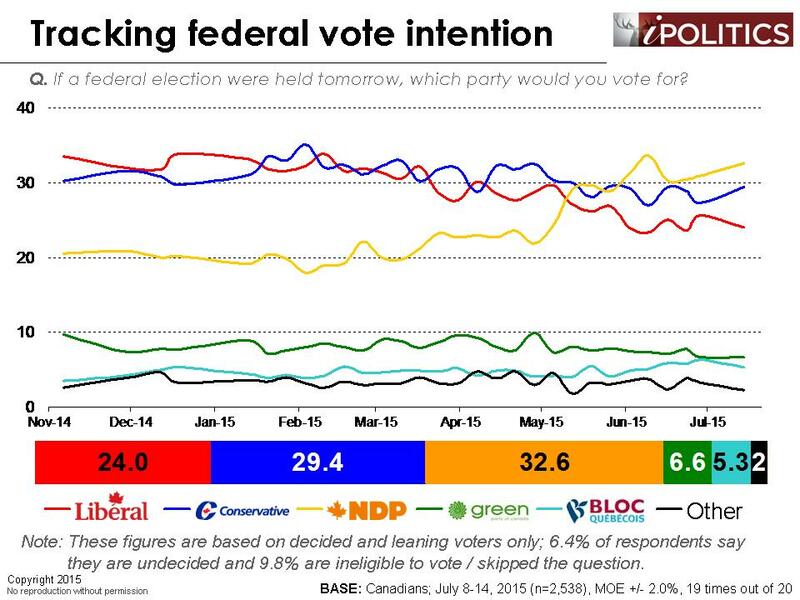 Over the past few years, we have noticed a steady increase in the proportion of respondents selecting “other” on federal vote intention. 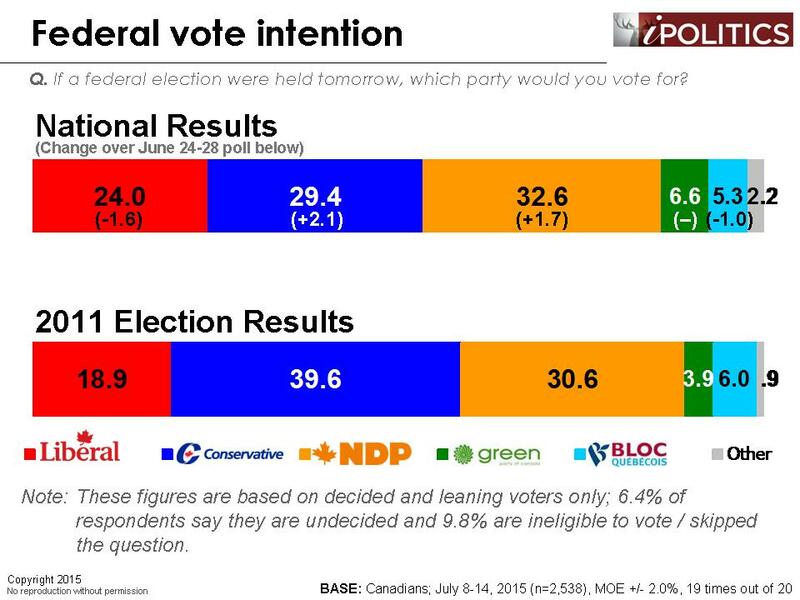 In our last poll, for instance, 3.3 per cent said they intend to vote for a party other than the Conservatives, NDP, Liberals, Greens, or Bloc. One possibility is that the unusually high incidence of “other” is due to the formation of Strength in Democracy, but this theory quickly falls apart when one considers that “other” was at just 1.6 points in Quebec, less than half the national average. Some who have noticed this trend have also suggested that these results reflect a rise of the popularity of Canada’s “fringe” parties. However, we have noticed that in almost all of our election polling, we have consistently overestimated support for “other”. For example, in the 2014 Ontario election, we overstated “other” support by a margin of 3.9 to 1.5. In the 2011 federal election, it was 1.5 to 0.9. Rather, we believe that the high incidence of “other” is a reflection of the growing dissatisfaction that Canadians feel with any of the mainstream choices and the rise of “other” reflects those who are simply trying to say “none of the above”. One final possibility is that given the increasing substitutability of the Liberals and NDP we discussed earlier, some Canadians are selecting “other” to express a preference for “two or more of the above”, although we have experimented with various wordings and clarifying the meaning of the response categories had no discernable impact. Whatever the cause, we know from past experience that “other” is being exaggerated by a factor of between two and four. 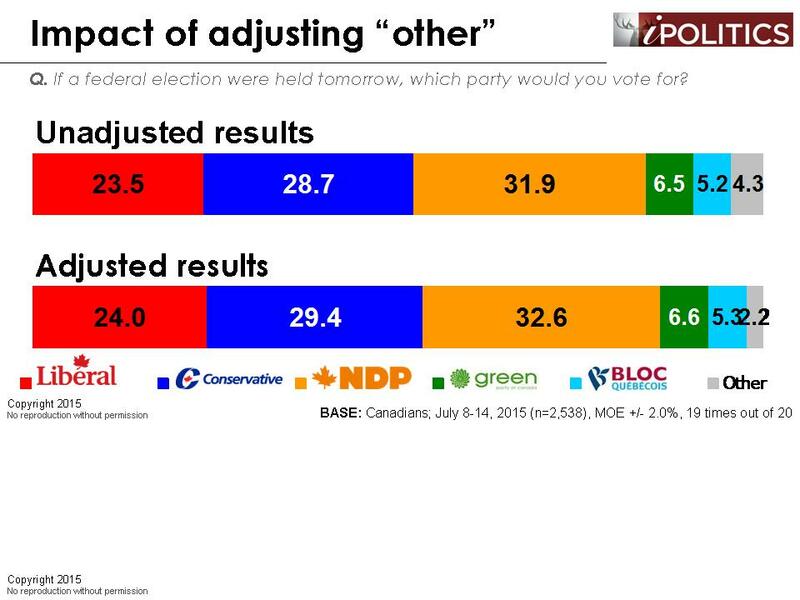 Therefore, from now on, we will be adjusting “other” downward by one-half (and re-allocating the difference among the other parties). While this adjustment may be imperfect, we believe that it will create a more accurate picture of Canada’s political landscape. The field dates for this survey are July 8-14, 2015. 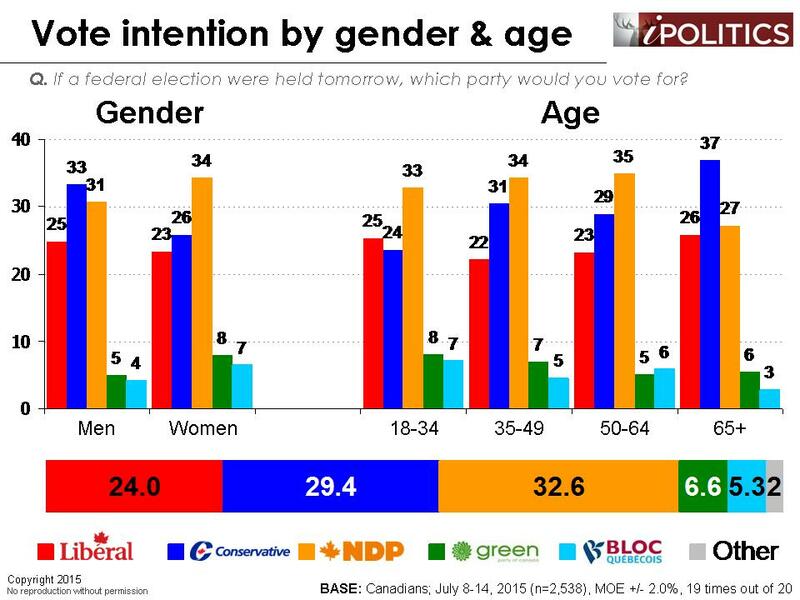 In total, a random sample of 2,538 Canadian adults aged 18 and over responded to the survey. The margin of error associated with the total sample is +/-2.0 percentage points, 19 times out of 20. Right on. Was eagerly awaiting this poll. NDP for the win! the liberals have dominated the university vote for my entire life. that is an ominous sign for liberal supporters – and liberal fundraisers. I am a progressive and want a government that reflects my perspectives and, I believe, the majority of Canadians. So party or leader preference are not that significant to me. I meet a large number of people who are pulling for government change and who are quite discouraged with the governance that we have had in the recent past. So how are people like me measured? Are we just distributed proportionately among the categories you do measure? Are my perspectives insignificant statistically? I note the progressive parties seem to stick with their knitting and hope the can pick up their fair share of this vote by not acknowledging it exists. They default to traditional electioneering of join the team and donate as sign of commitment. The part of the spectrum I represent is quite soft on commitment. Just a word remembering voters who were so happy at the last federal election for the Bloc’s results…on EPAC’s panel, I have told them not to take this fact for granted!!! Especially to observe what would happen depending of the federal’s attitude towards Québec!!! So here’,s the real facts….Bloc is back!